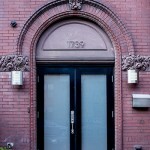 1310 19th St. is a an old town house near Dupont Circle, converted into offices. This entry was posted in Dupont Circle on January 31, 2014 . 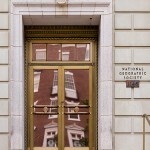 The National Geographic Society administration building was built on 16th St. next to the older original headquarters of the Society at 16th and M. The building was built in two phases, in 1913 and 1932. 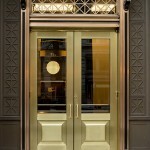 The reflections in the door are from the University Club across 16th St. This entry was posted in Downtown on January 30, 2014 . Glass is prevalent in most of the modern office buildings in the business district of D.C. 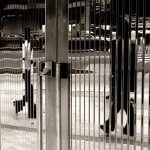 This glass door with metal bars reflects the constant stream of people walking by the busy corner of Connecticut and K Street. It was built in 2012, replacing a previous building from 1956. This entry was posted in Downtown on January 29, 2014 . 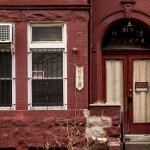 1504 P St. NW is a rowhouse divided into condos. It was built in 1865. 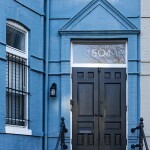 This entry was posted in Logan Circle on January 28, 2014 . This entry was posted in Downtown on January 27, 2014 . This entry was posted in Chinatown on January 26, 2014 . 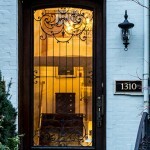 The townhouse at 1739 P St. has a plain door surrounded by elaborate brickwork. This entry was posted in Dupont Circle on January 25, 2014 . This entry was posted in Downtown on January 24, 2014 . 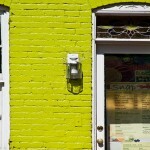 Snap is a cafe at 1062 Thomas Jefferson St. in Georgetown, in a typical old Georgetown row building. It was built in 1914. This entry was posted in Georgetown on January 23, 2014 . The Department of Justice building, on Pennsylvania Avenue, was completed in 1935. 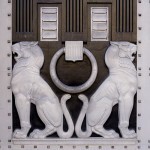 The building was designed to fit in with the other Federal buildings nearby, so it has many classical and Greek elements. 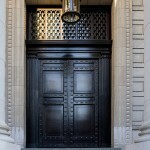 The doors are art deco, made of 20 foot high aluminum panels that slide into the building walls. This entry was posted in Downtown on January 22, 2014 .